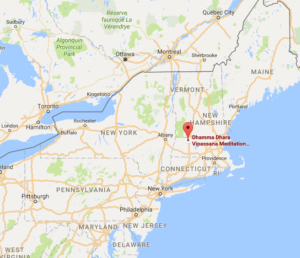 Dhamma Dharā is located in the town of Shelburne, Massachusetts, approximately 6 miles west of the the town of Greenfield, 6 miles east of the village of Shelburne Falls, in the western part of the state. Please make all of your travel plans (to and from) before arriving at the center, as you will not have access to your cell phone from the time the course begins until after the course is completed. Please ensure that your departure time from the Center is after 7:30AM. This will allow adequate time for the closing of the course on the final day. Students should make proper travel arrangements, allowing sufficient time for travel to and from bus and train stations and airports. If you have any difficulty, please do not hesitate to call us at (413) 625-2160 x309 or email rides@dhara.dhamma.org. Dhamma Dharā has no affiliation with any of the travel services listed on this page. Please send corrections to the Webmaster. For students already enrolled in a course, or considering applying for a course: Ride Share information will be included in your acceptance letter. If you would like to offer a ride to other students, please visit the Vipassana Rideshare Board for Dhamma Dharā using the link found in your acceptance letter. Google Maps directions to the Vipassana Meditation Center. There is a parking lot on site where you can park your vehicle for the duration of the course. From BOSTON: (2 hours) Either take Interstate 90 West (Mass. Turnpike) to Interstate 91 and head north on I-91 to Exit 26 (Mohawk Trail), or take Route 2 West to I-91 and head south to Exit 26. Then follow the map below. From NEW YORK: (4 hours) Take Interstate 95 North, then Interstate 91 North to Exit 26 in Massachusetts, and then follow the map below. By bus, take Peter Pan to Springfield, then switch over to Vermont Transit, to Greenfield. See below for additions information. From MONTREAL: (5 hours) Cross the Champlain Bridge and take the Eastern Townships Autoroute 10 to Exit 22. Then follow Autoroute 35 South through St. Jean and the Philipsburg border-crossing to U.S. Interstate 89 South. At White River Junction, switch to Interstate 91 South, and in Massachusetts get off at Exit 26 onto Route 2 West (Mohawk Trail) and follow the map below. From I-91 EXIT 26 in Massachusetts: Follow Route 2 West (Mohawk Trail) towards North Adams. After about three miles you will see a Greenfield Co-operative Bank ATM on your left. Take the very next right-hand turn onto Colrain-Shelburne Road, approximately 100 feet after the ATM. (Signs point to Colrain and Jacksonville, VT.) Follow this road for about two miles until you see the Vipassana Meditation Center sign on your left. Taxi Express is a company that runs a shuttle from Pennsylvania Station in New York City (31 Street and 8th Avenue) to the center. Reservations for the shuttle must be made at least 24 hours prior to the first day of the course. Reservations for this shuttle are round-trip only, and you cannot cancel the return trip. The driver will maintain contact with you by phone in order to coordinate pickup. The shuttle arrives at the Vipassana Meditation Center at 4:00 pm on the day your course begins and picks you up at 9:00 am on the day the course ends. For more information please visit their website. Deerfield Car also offers service to and from NYC. Note: This information was accurate as of August 5, 2016. Students and Servers need to arrive at Dhamma Dharā by 5 pm. One arrival per day. Price and schedule may vary. Once you arrive in Greenfield, an individual or group can take a 15 minute taxi directly to Dhamma Dhara (see taxi options below). It is best for students to congregate and book a taxi together to save money. You are welcome to use the ride-share board for this purpose. The Amtrak station in Springfield, Massachusetts has several arrivals per day. Requires a taxi drive to the center (see taxi options below). Pioneer Valley Tours can be contacted at info@pioneervalleytours.com. They will provide quotes on group travel, maximum 10 people, within MA only. These companies provide service to Greenfield, MA (about 15 minutes from Dhamma Dharā by taxi), Amherst or Northampton, MA (about 30 minutes from Dhamma Dharā by taxi) and Springfield, MA (about 45 minutes from Dhamma Dharā by taxi). Please call them or check their website for travel info (see taxi options below). There is one Greyhound bus from New York City to Greenfield MA that will get you to Dhamma Dharā on time. It leaves Port Authority at approximately 5:30 am. Registration at the Center will open at 2:00 pm. There is another Greyhounds/PeterPan bus leaving NYC at 2:15pm that arrives too late. Do not take this bus. There is a bus that leaves Boston at 12:01pm and arrives in Greenfield at 4:14pm. There are several Peter Pan buses from NYC to Amherst MA, leaving at 5:30am, 8:00am,10:30am. From Amherst, one can hire a taxi service to get to the center (see taxi options below). Do not take any later bus as you will not be able to reach the center on time. FRTA service twice a day from Amherst to Greenfield: http://www.frta.org/page558.html. From the JWO Transit center in Greenfield, you can take a taxi to Dhamma Dharā (see taxi options below). There are several Peter Pan buses from NYC to Northampton, MA, leaving at 5:30am, 8:00am, and 10:30am. From Northampton, you can hire a taxi service to get to the center. Do not take any later bus as you will not be able to reach the center on time (see taxi options below). FRTA service several times a day from Northampton to Greenfield: http://www.frta.org/page548.html. From the JWO Transit center in Greenfield, you can take a taxi to Dhamma Dharā (see taxi options below). Depart for Greenfield, Massachusetts at 8:45 am and 6:15 pm and cost $26 – $31 one way, taking 2 hours. Please note that all students should arrive between 2 and 4pm, so the 6:15pm bus is not typically suitable for use. On each beginning day of a course, Valley Transporter will offer a shared shuttle from Bradley Airport to The Vipassana Center. The shuttle will leave Bradley at 2:30pm and the Union Station Amtrak station in Springfield at 3:00 pm and the cost will be $75 plus tip per person ($60 for those that board in Springfield). To book this ride, you must call 413-253-1350 (or toll free 800-872-8752) at least two days before the first day of courses. Valley Transporter will also offer a return shuttle from The Center to Unions Station and Bradley on the last day of each course, leaving The Center at 9:00 am. The cost will be $75 plus tip ($60 for those that go to Springfield) and reservations should be made at least two days before travel date. For those who would not like to wait for the 2:30 pm, or 9:00 am shuttles, transport is still available, but at Valley Transporter’s normal rate of $96.60 per person. For detailed transportation information to and from Boston Logan call, 1-800 23 Logan. Taxi service is available from each terminal (arrival) curbside (see taxi options below). Airport T (metro) shuttle service is provided between airline terminals and subway. The Silver Line will connect you to the Red Line and Commuter Rail at South Station. From South station, you can take a bus or Amtrak train to Greenfield, which takes about 4 hours. Check with Greyhound, Peter Pan, or Amtrak. You can also contact Valley Transporter (800) 872-8752, Thomas Transportation (800) 526-8143,or Deerfield Car (413) 665-4369​ to check prices. There’s an online planner that will show you the options and times to get from JFK to the NYC bus or train stations. From Port Authority or Grand Central Station, look for a bus or train to Greenfield, Amherst, or Springfield MA. Budget will rent one way to Springfield, MA. National and Enterprise don’t do one way rentals to Western MA.